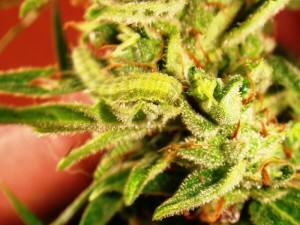 During the outdoor marijuana growing season there are many insects that feed on our marijuana plants. In this case we will discuss one of the more voracious predators for cannabis plants, which leaves them totally shattered and useless for their consumption, caterpillars. Caterpillars are the larvae of insects of the Lepidoptera family, more known after their metamorphosis into beautiful butterflies. There are many species of butterflies that can be found all over the world so there will also be many types of different caterpillars, with different colours and sizes but with clear characteristics in common, such as a segmented body, their 6 legs or the hooks of their false legs. 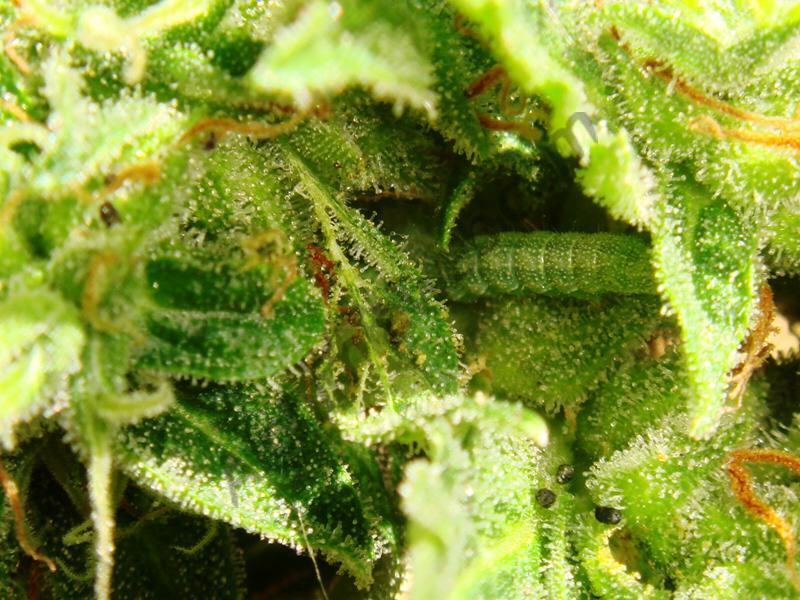 Before finding a caterpillar in our marijuana plants, we’ll see how the butterflies lay down on the buds or leafs, usually in the highest parts where the biggest and unattainable buds are located. Butterflies generally deposit their eggs prior to the arrival of the winter season, so these eggs will hatch when ambient temperatures are the appropriate, needing the heat of the end of summer, which coincides with the arrival of winter in about two months. It is very feasible that butterflies deposit their eggs and these don’t hatch until appropriate conditions prevail. 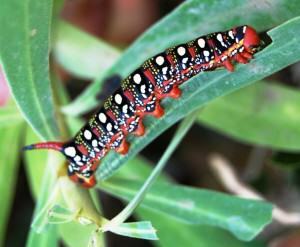 Caterpillars have a long body divided in segments of different colours, generally adapted to camouflage themselves among the vegetation, avoiding this way to be eaten by birds or other natural predators of these insects. They move using their 6 main legs along with 10 false legs distributed throughout their body, which can be located in different parts according to the type of Caterpillar. These voracious predators of green matter don?t breathe through their mouth but through a few small holes that are scattered throughout their, called spiracles. These holes lead to an internal network of interconnected tubes or trachea which provide the oxygen directly to the cells, being a very effective and spectacular respiratory system. 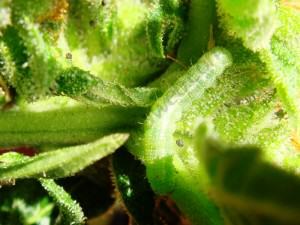 How to detect the attack of caterpillars on marijuana plants? We have explained that butterflies leave their eggs on the leafs of plants, but we haven’t mentioned that these leafs will be the first vital sustenance for newly born caterpillars. It should be noted that not all caterpillars prefer the same type of leafs, so we can find different types of caterpillars on cannabis, but we will usually find the same type of caterpillars , belonging to the same species, if we cultivate in the same geographic location. First of all, we must thoroughly observe the plant, looking at those leaves or buds that are found in the highest parts of the plants, where butterflies lay their eggs. At first sight it?s really complicated to be able to see the eggs, but if we carefully examine the plant they will be distinguished as small sets of dots that acquire different colours (white/yellow) and shapes (round or oval), depending on the type of butterfly egg. After this initial inspection – and during the whole flowering period – we must look at the buds, starting at the top and thoroughly examining the rest of the plant in search of small black remains or darker parts of the buds, which are sign of rottenness. The first attacked flowers are the bigger ones, but without being extremely compact, so caterpillars can easily pierce them and devour the softer tissues, such as the small branches of the lower parts of the buds. In the case of finding a caterpillar, we should make a daily inspection of the whole plant, especially on those hours when the Sun is low and the ambient humidity is high, although it is very easy to find them on the rest of the day, eating nonstop, as their hunger is insatiable and voracious. 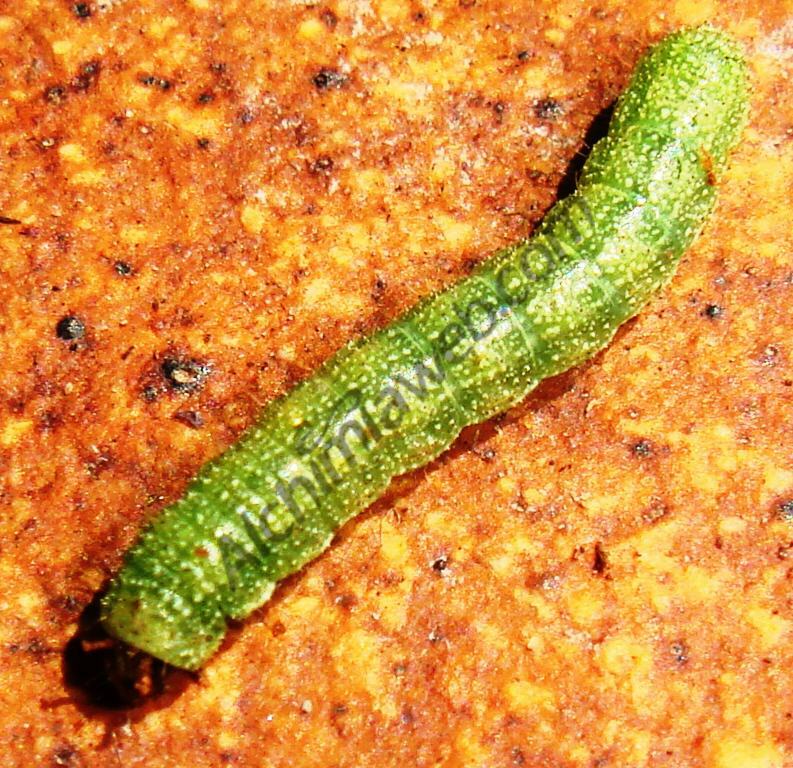 How to prevent or eradicate caterpillar pests? After an exhaustive search in our plants – and if a caterpillar is detected or if we observe any bitten bud -we should apply a product that repels or kills the eggs and larvae of butterflies. These products are generally created on the basis of a gram-positive bacillus – such as Cordalene – that is naturally found in the soil and also on plants. Such products are specifically created to treat lepidoptera larvae plagues, being more or less effective depending on the type of larvae to treat, but always offering great results. We can also treat the plants with broad-spectrum products to control caterpillars apart from other possible pests that can occur at the same time, in this case we could apply Mittel Concentrate in a dosage of 1 ml/l. When the butterfly larvae eat the vegetable matter treated with these product, they will intoxicate and die, leaving the plant free of intruders. Another product with which we can treat caterpillars and other types of insects – sucking insects – is Pireprot , which contains pyrethrins as active ingredient, acting by contact and leaving cannabis plants free of insects. In this case, caterpillars would be removed from the plants leaving them clean to continue flowering without mishaps. It should be noted that all the above-mentioned products are bio-degradable and biological, so they can be used several times when required as a preventative or to eradicate Caterpillar plagues. The security period is relatively short but it?s recommended – and important – not to apply the product during the last 15 days before harvesting the cannabis plant to give time to the treatment to not leave traces of the product in the buds. In the case that the plague appears in these last 15 days we have to carefully observe the plants every day, opening the buds to see if caterpillars are hidden inside the flowers. If we don?t proceed this way it?s very possible to harvest the plants with the larger buds clearly affected or even to throw them away because of caterpillars bites and defecations, which cause the appearance of fungi like botrytis. In the case of having the plants affected by botrytis, you can treat them as long as you can leave a security period of 15 days before harvesting the plants. If the end of the flowering stage is near, the best will be to look at the state of the trichomes and – if these are mature enough – harvest the plants. Once harvested, we should instantly proceed to remove the infected parts from the healthy ones. If we do not separate these parts infected with fungus this will extend to end up rotting the whole bud, even during the drying phase, as it requires a few days to lose much of the humidity contained in its metabolism. After harvesting the marijuana plants we should hang the plants upside down to perform a proper drying of the cannabis buds. In this way, plants lose their humidity and stop being a good hideout for those caterpillars that have been able to survive the purge realized by hand. These caterpillars will leave the plant to be able to become butterflies, so when plants are dried, we?ll be able to see the caterpillars sliding down from the bud making rappel until arriving to the ground. Once arrived to the ground, they will quickly seek another vital sustenance to be able to feed and continue their vital process, so it?s important to recover these caterpillars to prevent that they fill our house with cocoons and later with butterflies, as they embed in the most unlikely and generally inaccessible places. Locate the butterflies that lay down on the plants. Look for eggs on the leafs. During the flowering phase, control the buds looking for signs of bites. In case of detection, apply Biothur or another product against caterpillars. Stop applying the product within the last 15 days. 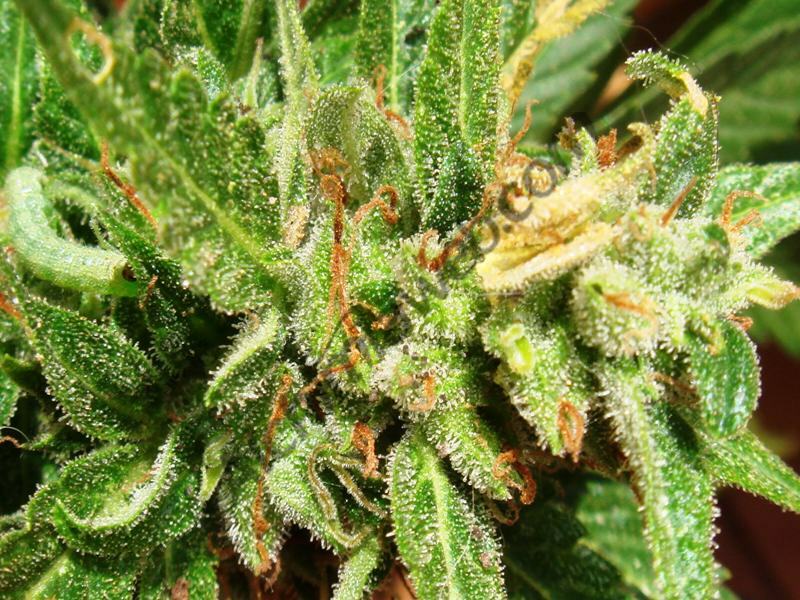 Review the plants and buds after harvest and remove the infected or bitten parts. Capture the caterpillars by hand in the case of not being able to apply the product. If you harvest your plant with caterpillars in it, once the plant starts drying they will leave it looking for alive green matter to eat. You can see them rappeling down from your buds. What you need to do is looking for the appearance of fungus like Botrytis, often caused by caterpillar bites. If you see any dead part of the plant/bud, carefully remove it so the fungus doesn’t spread. Once the plant is properly dried, there should be no caterpillars in it. These bugs usually put their eggs on the leafs, so we propably won’t find any of them in our buds. A final visual exam of your dried buds before storing them is advisable. Thanks for your confidence, hope it helped!! resemble and is it toxic in any way? The plants really showed little signs of them while alive, but were very prevalent in the manicuring and now drying process. Now rolling into curing process as the moisture is getting depleted, I continue to rearrange and layer my buds in a large chest and continue to find smaller catapillars climbing out to find a new food source. Damn I hate outdoor growing except for the cheap light source. Let me know if you might have info on their little droppings I mentioned. However, it is strange having them in your dried buds; maybe you stored them too early while they still had little moisture in them. Next time, try to hang your plants for some more days. Notice that certain strains are more prone to get caterpillar pests, so it is advisable to check which varieties will work better in your environment. If you know that caterpillars are common in your area, start treating your plants since the beginning of flowering, never wait to see them to start treating them. Caterpillars eat our plants, so it all depends if our plants have toxic substances in them. If you made an organic crop, there’s no problem at all, since caterpillars are eating organic food and so have no toxic elements in their system. If you used some chemicals on your plants, caterpillars will also absorve them via their food; in this case, you will have the same type of substances in your plants and in the caterpillars that are eating them. Still, nothing to worry about. Oh man, those things are NASTY. We are about one/two weeks from harvest and just discovered some caterpillars, I found them since there were some rotten/brown spots on buds which I couldn’t explain. I first thought it’s bud rot from spraying or from the rain. Until I looked closer and saw the bastards. Now I did order Biothur but I guess it’s too late, will just have to pick them off by hand on those plants until harvest. I just picked two off and wife found another two just now. Always find really helpful stuff here on your blog by the way. At least in Spain, and from what I’ve heard and seen this year, caterpillars have become a problem. As you mentioned, the rotten buds are typical symptoms of caterpillar attacks. As always happens with pests and diseases, normally prevention makes the difference. Next year, start spraying your plants before seeing any kind of symptom, especially during the pre-flowering stage of plants and the first weeks of bloom. Many people use nets to cover their plants and prevent caterpillars, it works great! Yes, caterpillars can really be a pain in the neck. I’ve seen this year some people who build cages for their plants using insect netting, and it works great!! I’ve discovered another one of my babies has been attacked partially by them. It’s is in at least it’s 7th week of flower if not 8th and all the stigmas have turned and began to draw up into the calyxes. And I’m thinking it’s probably best to go ahead and cut it. It’s over 8 ft and has great genetics so I’d hate to jeopardize any more bud to the infestation. My question is if I should just go ahead and harvest. I’d feel better if I could check my trichs but my loop is shattered and I live so far from town that I haven’t made it into town to replace it. And since it’s up to guess work with out it I thought maybe u could give me some advice. Thank you for any answer u might have and I really appreciate all the info u put up for ppl like me. It’s turned me from novice to pro in just a couple seasons and I now produce the best outdoor and indoor of anyone I’ve met in my area. If you feel like they are a real threat to your plant, I’d harvest it as soon as possible. I don’t like to harvest my plants before I should, but if there is some risk of losing all the work done during the past months I’d just chop it and perhaps make some concentrate. It seems clear that at the exact second that the “green” culture is threatened by a butterfly, its “green” god become the green dollar bill. Need to get beyond that. When our land was “great” (e.g. before a billionaire mongol sat up offices to rule his kingdom, and quite some time before then), “weed” was everywhere and likely many species of butterfly, etc. counted on it. Cringing due to having “weed” confined and legislated so bad that crop loss due to how pretty butterflies reproducing effects our way of dealing and how we feel about common nature is a shame. Green should be green, through and through, and not Trump green. I started growing for personal use after a lull of 40 years. I have been finding 3 types of caterpillars, loopers looking like they ate Viagra, solid green ones, and ones with bands of green all relatively small but today I learned that they have long been in my buds and that their visible symptoms there are not eaten leaves (because what’s eaten is not often visible outside the buds) but browning spots and (to a far lesser extent) caterpillar poop. I actually raise butterfly caterpillars (these are from small flying-rat moths) and so I pluck and chuck them when not enraged. There’s no way I’ll use “safe” insecticides or Dr. Frankenstein parasites or germ warfare, but with my new knowledge of bud damage I hope to minimize their wrath. I had feared mold which also has been a problem. Sorry to hear you’re having trouble with caterpillars. By far the best remedy is prevention, and I’m afraid it involves using what you refer to as “Dr Frankenstein germ warfare”!! Experienced gardeners start using an organic preventative spray of Bacillus Thuringiensis early in the season. It’s a naturally occurring bacteria that destroys the guts of young caterpillars, but is non-toxic in humans. It won’t work properly once the budworms are fully grown, so it’s important to apply early and repeat applications frequently throughout the season. Your fear of fungal infection, however, is more than justified, as the poop left by the caterpillars will rot and as a result Botrytis is almost certain to attack the flowers, and by the time you notice the caterpillar damage, it may be too late, meaning preventive action on the caterpillars is best to ensure a high quality crop free from pathogens. Best of luck, and happy harvesting! Thanks for your interesting comment! I know some guys who build cages for their plants made of anti-thrip netting, kind of green houses but with netting instead of plastic. It works great, you wouldn’t find a single caterpillar! I was admiring the pretty butterfly this morning. He came to visit the top branch of my plant. Then, he flew away. Oh boy! I want to , ah, prevent this from happening! Hi David, I’m not sure I fully understand your question… however, if you want the butterfly to visit your plants, maybe try planting some butterfly-friendly flowers nearby to attract them, but if you want to keep the butterflies from landing on your plants, I’m afraid the only option is to use some kind of netting to cover them. I hope that helps! These guys have devastated all three of my plants this year. This is my first time growing in 30 years (now legal here) and Im not sure I was prepared for an insect that could do the kind of damage these lil critters dish out. Learned a good lesson in backyard growing but it cost me about 1/3 of my harvest. Thanks for the great info on fighting back against these guys next season. Hi Kenny, thanks for your comment, I’m sorry to hear about the devastation to your crops, I’m glad at least that you’ve managed to save some though, that in itself is an achievement! So next year you now know to start early in the season with treatments of a product containing Bacillus Thuringiensis (BT), applying every 8-10 days to coincide with the life cycle of the caterpillars and to make sure you get them when they’re young for the greatest effect. Another thing to look into is the idea of releasing predators like Chalcid or Braconid wasps into your garden, these insects parasitise and lay their eggs on caterpillars, and can be an additional, very effective control method to use alongside BT as part of a pest management programme. Enjoy your harvest and best of luck for next season, happy growing! Hi Kathy, thanks for your suggestion, however I’ve seen chickens do some really devastating damage to cannabis plants before, leaving them completely leafless! Once they get the taste for it they don’t stop! I love chickens, I keep them myself and they’re great to have around the plants to eat pests and for their small manure deposits, but it’s absolutely essential to protect the plants from them, they can be so destructive! All the best! I live in the San Francisco area, where the temperature between day and night can fluctuate as much as 30 degrees during this time of year (and the cool temps plus fog is a real problem if one is trying to prevent bud rot). I only have three plants (2 Gorilla Glue and 1 Blue Dream), and only recently discovered caterpillars dining on my beautiful crop. I now spend around 45 minutes per plant per day gently separating the bud leaves, looking for either caterpillars or their telltale brownish rotted leaves their munching creates, pluck the rot, then use a toothpick to remove the caterpillars and toss them FAR away from my girls (I can’t bring myself to squish ’em; I believe that their instincts should not be punished). So far, I’ve thankfully only found them on the Gorilla Glues, but I’m guessing that won’t last. I’m toying with the idea of harvesting early, as my GG ‘chromes have just begun to turn amber (only around 10% of them have turned, so this would definitely be early); on the other hand, as long as I’m as diligent as I have been for the past two weeks, then although they’ve now decimated at least 50% of my cola tops (they seem to enjoy going for the largest, juiciest buds they can find, and those are of course usually at the top of the colas), I might be able to keep them alive and relatively uneaten (and hopefully as rot-free as possible) for another week or so. My other issue is spider mites and their webbing, and although I used NukeEm successfully, the mites have now come back, and I’m wondering whether to give them one more spray before harvest (NukeEm is organic and turns inert after 48 hours, so should be fine as long as the plants are well-flushed before harvesting…but I want to NOT water them for a few days before chopping, so this has become a conundrum). If your GG plants are one week away from harvest, I’d try to harvest them asap, especially if you also have spider mites. It’s not the ideal situation, but I’ve thrown away so many buds for waiting too much that I’ve learned the lesson. You can try to remove the spider mites manually with a sponge or something similar (also remove any fan leave infected by mites), but I would not risk the whole crop for having a few more amber trichs. (I’m not a fan of spraying plants soon before harvest). I’m probably a week or two away from harvesting my Blue Dream, and just saw that the caterpillars have now taken up residence there and are already munching and destroying. Can anyone tell me if I’m far enough away to be able to hit it with Botryprot without negatively affecting the end result? Sorry to hear about your caterpillar problem, I’d recommend that next time you spray preventively with Bacillus Thuringiensis every ten days from pre-flower stage up to two weeks before harvest to avoid this invasion. According to the manufacturer, Botryprot has a safety period of 15 days so if you’re harvesting in two weeks then that should be fine, but not if you’re planning to chop the plants any earlier. In your position I would pick out the caterpillars by hand and remove any of their poo and rotten bud around it. Then I’d spray very locally with Aptus Fungone to stop the mould spreading further. Good luck, I hope you manage to save your buds, happy harvesting! Those are mother caterpillars. I have never found a butterfly caterpillar on my cannabis plants. Moths fly at dusk and at night. You chemical approach turns me off; I’m tired of Big Ag. Cut the chemicals and screen out the pests. Also, drying the plants is extremely counterproductive if infested, because the caterpillars continue to eat and grow until the plants are too dry just as they do at the end of their season in the desert when plants are drying up. Hi Robert, thanks for your input. In different parts of the world butterflies can be a problem, while in other parts there are more problems with moths, but that’s by the by, whether they’re butterfly or moth caterpillars the approach is the same, we’re growers not lepidopterists! We’re not exactly fans of Big Ag either, so of the three solutions we’ve given, all three are 100% organic: Cordalene is based on Bacillus Thurigenesis, a naturaly ocurring bacterial inoculant that kills young caterpillars; while Mittel and Pyreprot are based on Pyrethrin, a naturally occurring pesticide sourced from chrysanthemum flowers. All totally safe and non-toxic to humans. We definitely wouldn’t recommend cutting and hanging the plant to dry if it’s still infested, of course not! 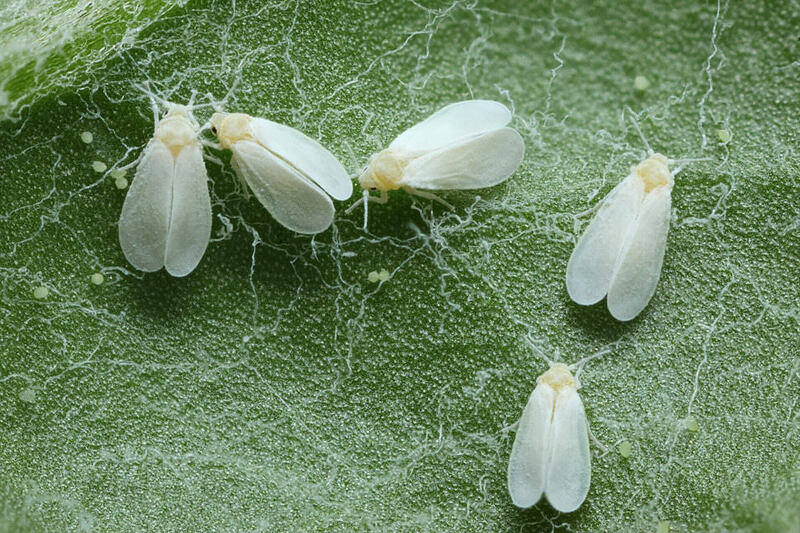 The idea is to remove the pests, and then harvest and dry the plant to avoid the appearance of mould due to the caterpillar damage, and hopefully save the crop from loss. Thanks again for your comment, I hope that’s cleared things up for you, all the best! From my experience over the years netting “Helps” some. But where there is a will there is always a way. I have seen on many occasions where the moth/butterfly will lay its eggs in the netting and once it hatches drop directly onto your plants waiting below. You must check your netting regularly. Also as noted above the caterpillars themselves are migratory. Meaning that they will crawl along the ground and under any loosely applied netting to get to your plants! All in all it is far better to go all in when try to prevent caterpillar attacks. They sure go all in trying to get to them! I grew in Maine for 20 years before moving to Southern Cal so didn’t have the same pest problems that exist here. The moths that lay eggs that grow into green bud eating caterpillars are the most destructive. They seem to lay eggs on the largest buds located on the tallest part of the plant. Once you start seeing damage, i.e. dead brown areas that quickly begin to mold, you are already infested and there are probably tons of them. I’ve tried netting, it helps significantly but its not fool proof and I’ve never been able to prevent all of the egg laying moths from getting to the plants somehow. Spraying with Bacillus Thuringiensis (Monterey B.T.) at start of flowering, every 5-8 days, at dusk, RELIGIOUSLY, right up to a week or so before harvest resulted in the least amount of caterpillar damage in my four seasons growing outside. I read that the live bacteria digests the eggs before they can grow into a leaf eater. You can’t grow outside around here without taking extensive steps to deter the numerous pests that attack Cannabis. The whole health of the plant is effected by seemingly minor pest activity. Stressed plants don’t grow like happy plants, there is a BIG difference. I took me years to get my dark green thumb. I spend a couple hours in my gardens and I still learn new things all the time. You need two green thumbs and a bunch of expensive biological weapons to succeed cultivating Cannabis outdoors here in Southern Cal. 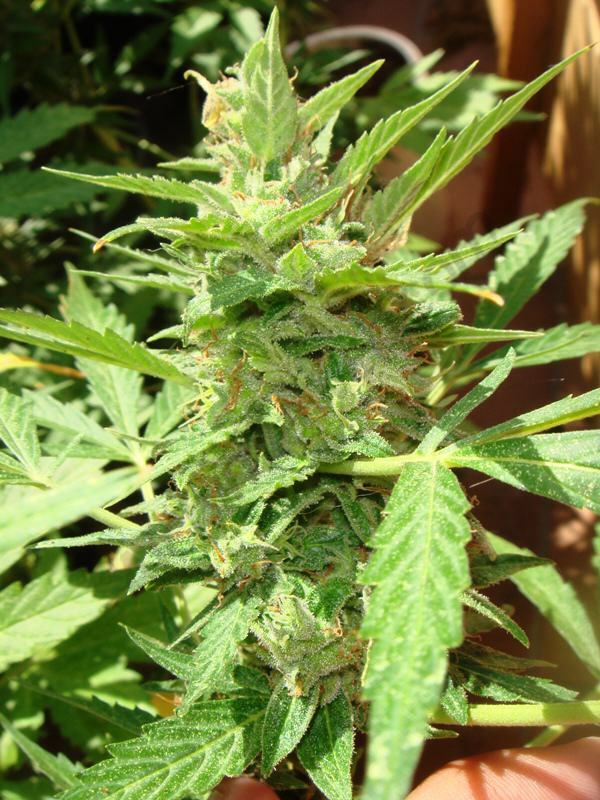 it is not as problematic a crop in other places but here it certainly can be a challenge one that even an experienced grower can struggle with. There were less avenues to failure cultivating back in Maine, I would have given up if I first started out here. Spraying mature flowers with a water solution at night should generally be avoided, the practice is just asking for mold issues, especially if inside a green house environment. Mold was more problematic in Maine where wet weather regularly continues for days and the higher humidity and cold nights can prevent tight maturing buds from being able to completely dry (externally) creating conditions for mold to explode. During the last 2 weeks of flowering wet weather can result in complete loss from mold. Once it starts, it will spread quickly and continue to ruin all your hard work even while hanging inside to dry. I used “Nuke Em” last year which claims to help prevent mold from starting and spreading, its organic and can be applied right up until harvest day. The label claims effective against all kinds of pests like spider-mites and caterpillars but I don’t have any personal experience using it in that capacity. The only active ingredient is citric acid, you can use some PH down to basically do the same thing and save yourself some $, I paid $55 at a grow shop for 1 quart of Nuke ’em, don’t know if it was all that. That green thing looks exactly like a caterpillar that was eating my California Blue Bells. From what I read they pretty much eat anything, its a moth caterpillar, English something. I have had the little green catepillars in every grow. Some years worse than others. I don’t use chems. Lost coast plant therapy will kill the larvae and not hurt the birds. If you can attract the little black capped chickadees to your grow they will wreak havoc on the catepillars, chickadees love catepillars and they are always around my grow. I have been examining the buds daily and plucking the ones that the chickadees missed. I was just wondering if anybody has tried smoking them out , like lighting a piece of paper on fire , then blow it out and wave the smoke under your branches and see if the little suckers will come out that way ? Have you ever tried that or would it just ruin your plant ?